You are here: Home / News/Events / Events / Benefit Concert – Nov 19th. 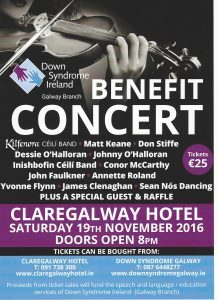 We are delighted to announce our upcoming Benefit Concert in the Claregalway Hotel on Saturday 19th November 2016. A line up of well known Irish musicians and singers will perform on the night….Kilfenora Ceili Band, Matt Keane, Don Stiffe, Dessie O’Halloran, Johnny O’Halloran (to name a few!) along with sean no’s dancing and a surprize special guest. All the artists are very generously giving their time for free and all proceeds from concert ticket sales will fund speech and language/education services for our DSI Galway Branch members. This night is also an opportunity for parents, friends, neighbours to get together and enjoy a night out (which we all could do with! ), with tickets favourably priced at €25 pp, available from the Claregalway Hotel or through the PayPal link below. Galway Masters Basketball Tournament 2016 – Nov 5th & 6th Benefit Concert – Special Guest! !